1In Stock Only! Dealer Trades/Ordered Vehicles/Locates not inclluded in this program. For returning Faulkner Buick GMC Loyal customers. 2Not available with lease and some other offers. See dealer for details. 3See dealer for details. CONQUEST INCENTIVE FOR CURRENT OWNERS/LESSEES OF A 2005 OR NEWER NON GM (I.E., NON-BUICK, CADILLAC, CHEVROLET, GMC, HUMMER, OLDSMOBILE, PONTIAC OR SATURN) PASSENGER CAR OR TRUCK 4Monthly payment is $13.89 for every $1,000 you finance. Average example down payment is 4.5%. Some customers may not qualify. Not available with leases and some other offers. Take retail delivery by 4/30/19. See dealer for details. Lease for $252/month for 36 months with $2,344 due at signing and 10,000 miles per year. Payment expires on 04/30/19. Estimated Lease payment based on 36 months and $2,344 due at lease signing. Excludes title, taxes, registration, and license fees. Mileage charge of $0.25 per mile over 10,000 miles. Not all consumers will qualify. Residency restrictions may apply. Lease for $256/month for 36 months with $2,376 due at signing and 10,000 miles per year. Payment expires on 04/30/19. Estimated Lease payment based on 36 months and $2,376 due at lease signing. Excludes title, taxes, registration, and license fees. Mileage charge of $0.25 per mile over 10,000 miles. Not all consumers will qualify. Residency restrictions may apply. Lease for $257/month for 36 months with $2,384 due at signing and 10,000 miles per year. Payment expires on 04/30/19. Estimated Lease payment based on 36 months and $2,384 due at lease signing. Excludes title, taxes, registration, and license fees. Mileage charge of $0.25 per mile over 10,000 miles. Not all consumers will qualify. Residency restrictions may apply. 1In Stock Only! Dealer Trades/Ordered Vehicles/Locates not inclluded in this program. For returning Faulkner Buick GMC Loyal customers. 2Not available with lease and some other offers. See dealer for details. 3See dealer for details. CONQUEST INCENTIVE FOR CURRENT OWNERS/LESSEES OF A 2005 OR NEWER NON GM (I.E., NON-BUICK, CADILLAC, CHEVROLET, GMC, HUMMER, OLDSMOBILE, PONTIAC OR SATURN) PASSENGER CAR OR TRUCK 4This vehicle has high interest. Call now before it's to late 5Monthly payment is $13.89 for every $1,000 you finance. Average example down payment is 4.5%. Some customers may not qualify. Not available with leases and some other offers. Take retail delivery by 4/30/19. See dealer for details. Lease for $258/month for 36 months with $2,424 due at signing and 10,000 miles per year. Payment expires on 04/30/19. Estimated Lease payment based on 36 months and $2,424 due at lease signing. Excludes title, taxes, registration, and license fees. Mileage charge of $0.25 per mile over 10,000 miles. Not all consumers will qualify. Residency restrictions may apply. 1In Stock Only! Dealer Trades/Ordered Vehicles/Locates not inclluded in this program. For returning Faulkner Buick GMC Loyal customers. 2See dealer for details. CONQUEST INCENTIVE FOR CURRENT OWNERS/LESSEES OF A 2005 OR NEWER NON GM (I.E., NON-BUICK, CADILLAC, CHEVROLET, GMC, HUMMER, OLDSMOBILE, PONTIAC OR SATURN) PASSENGER CAR OR TRUCK 3This vehicle has high interest. Call now before it's to late 4Monthly payment is $13.89 for every $1,000 you finance. Average example down payment is 4.5%. Some customers may not qualify. Not available with leases and some other offers. Take retail delivery by 4/30/19. See dealer for details. Lease for $267/month for 36 months with $2,480 due at signing and 10,000 miles per year. Payment expires on 04/30/19. Estimated Lease payment based on 36 months and $2,480 due at lease signing. Excludes title, taxes, registration, and license fees. Mileage charge of $0.25 per mile over 10,000 miles. Not all consumers will qualify. Residency restrictions may apply. Lease for $275/month for 36 months with $2,518 due at signing and 10,000 miles per year. Payment expires on 04/30/19. Estimated Lease payment based on 36 months and $2,518 due at lease signing. Excludes title, taxes, registration, and license fees. Mileage charge of $0.25 per mile over 10,000 miles. Not all consumers will qualify. Residency restrictions may apply. Lease for $276/month for 36 months with $2,526 due at signing and 10,000 miles per year. Payment expires on 04/30/19. Estimated Lease payment based on 36 months and $2,526 due at lease signing. Excludes title, taxes, registration, and license fees. Mileage charge of $0.25 per mile over 10,000 miles. Not all consumers will qualify. Residency restrictions may apply. Lease for $269/month for 36 months with $2,520 due at signing and 10,000 miles per year. Payment expires on 04/30/19. Estimated Lease payment based on 36 months and $2,520 due at lease signing. Excludes title, taxes, registration, and license fees. Mileage charge of $0.25 per mile over 10,000 miles. Not all consumers will qualify. Residency restrictions may apply. Lease for $279/month for 36 months with $2,526 due at signing and 10,000 miles per year. Payment expires on 04/30/19. Lease for $281/month for 36 months with $2,561 due at signing and 10,000 miles per year. Payment expires on 04/30/19. Estimated Lease payment based on 36 months and $2,561 due at lease signing. Excludes title, taxes, registration, and license fees. Mileage charge of $0.25 per mile over 10,000 miles. Not all consumers will qualify. Residency restrictions may apply. The new GMC Terrain is available for sale at our Trevose dealership. What complements this compact SUV is its upscale interior and a powerful engine. 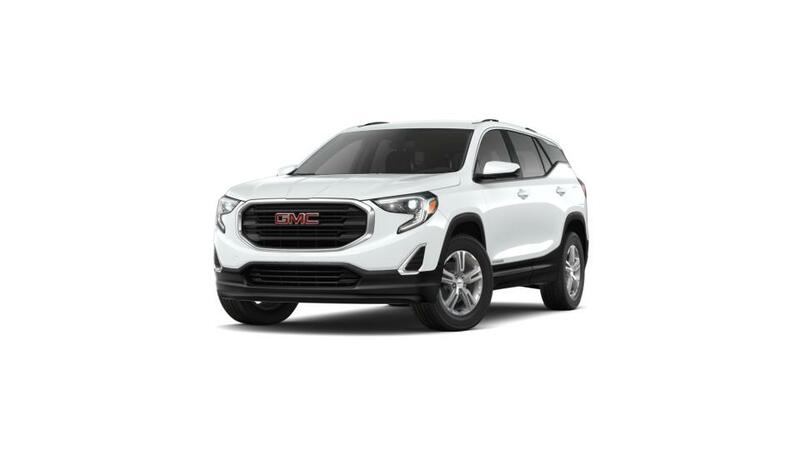 Available in two drivetrains, the GMC Terrain is a must-buy. Its infotainment system is quite good and will keep you well entertained and connected in Trevose. This compact SUV is for those who are looking for a versatile vehicle. The Terrain’s interior comes standard with cloth upholstery. The seats in this vehicle are super comfortable. Loaded with lots of quality materials, this vehicle is quite premium than its other rivals. Visit Faulkner Buick GMC Trevose to test-drive this SUV today!